The genus Tajuria comprises some very beautiful iridescent blue Lycaenids. 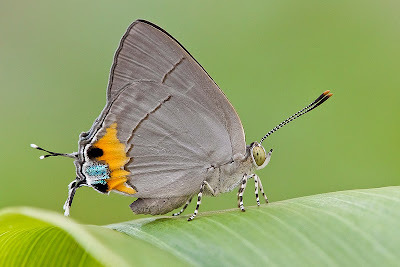 In particular, the males feature a nice aquamarine blue on the uppersides of the wings. All the species in the genus feature two pairs of tails on the hindwings. ButterflyCircle's junior member, Jonathan Soong, chanced upon the pupa of this very rare Tajuria dominus dominus and was rewarded when it eclosed into a beautiful specimen. He managed an excellent shot of the perching butterfly before it took off to the treetops and its newfound freedom!